Order your own copy of Elements Unbound at your local retailer or online through our website today! 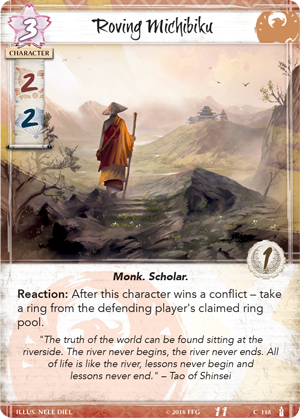 Throughout the Elemental Cycle, Rokugan has teetered on imbalance. The Air swirls into raging hurricanes, Water coalesces into raging tsunamis, Fire becomes a raging inferno, the Earth heaves and shakes, and the Void threatens to consume all. Amid this chaos, the clans still bicker in the courts and clash on the battlefield. But if these samurai don’t recognize the signs at hand, will there even be an Emerald Empire left to fight over? 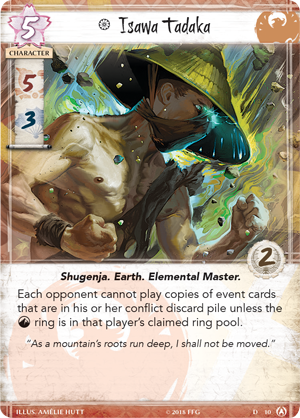 Join us today as we preview Elements Unbound, the final Dynasty Pack in the Elemental Cycle for Legend of the Five Rings: The Card Game! 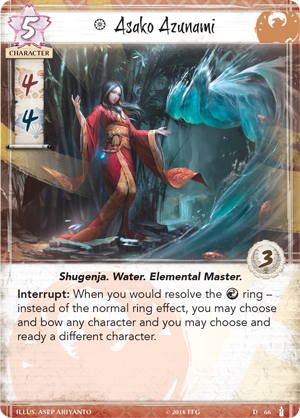 Elements Unbound ties the themes of the Elemental Cycle together, introducing new Shugenja and Spells, as well as three new ancient Creatures, a new way to duel, and a new stronghold representing the changing world of Rokugan. With the elements out of balance, ancient creatures aid the Great Clans in the conflicts to come. 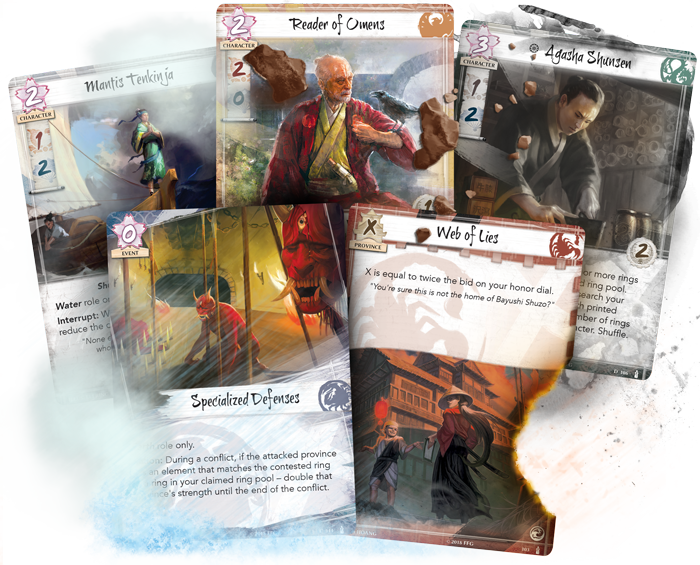 Elements Unbound introduces three more of these ancient beasts, including new additions to the Scorpion and Crane Clan. 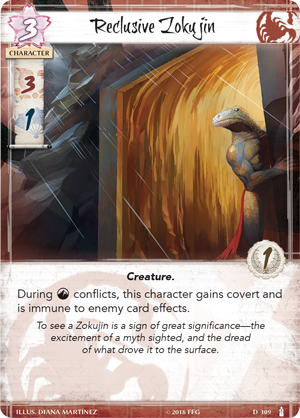 The Reclusive Zokujin (Elements Unbound, 109) is as sneaky as it is deadly, a perfect fit for the shadowy Scorpion Clan. During an Earth conflict, the normally subterranean Zokujin gains covert and is immune to enemy card effects. This means that the Zokujin can help you slip past one of your opponent’s best characters, while protecting itself from any kind of retaliation. Traditionally stronger in the political arena, the Reclusive Zokujin also gives the Scorpion a key boost to their military skill, and is likely able to negate the impa your biggest threat. While this effect only works during an Earth conflict, the Scorpion are often looking for ways to refill their conflict hand, and the Zokujin and Earth conflicts can be the perfect way to accomplish that. Still, your efforts may be stymied if your opponent’s biggest threat also happens to bear the covert keyword. The Crane are some of the greatest Duelists in the Empire, and the Tengu Sensei (Elements Unbound, 105) excels among them. 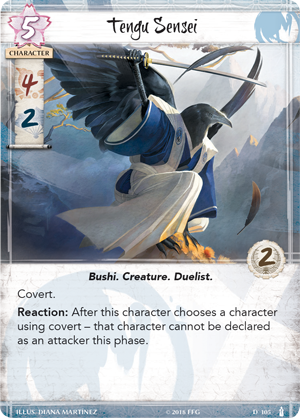 An ancient and noble Creature, the Tengu Sensei can not only defeat your opponent’s characters, but completely immobilize and prevent them from counter-attacking. When the Tengu Sensei bypasses a character with his covert ability, that character cannot be declared as an attacker for the rest of this phase! This can completely lock down even the strongest of foes, and with four military skill on the Tengu’s side, he is already an impressive attacker in its own right. 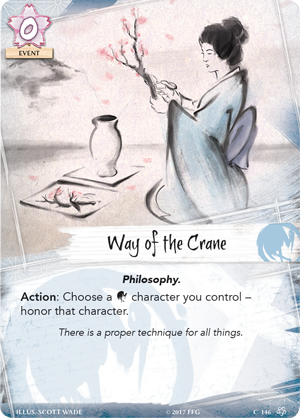 With two glory and a full suite of ways to honor Crane characters, including the Way of the Crane (Core Set, 146) and the Callow Delegate (All and Nothing, 85), the Tengu Sensei can be the centerpiece of your forces, negating powerful characters while breaking provinces with exceptional military and political skill. No one truly understands the state of the elements like the Phoenix. They have seen the signs heralding destruction, and despite the fact that the elements are becoming unbound, they still maintain control and call on these elements to fuel their Spells. In impressive displays of skill, the Phoenix can remind Rokugan of the wisdom—and power—that they wield. 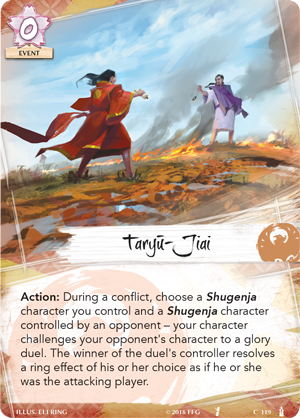 A Taryū-Jiai (Elements Unbound, 119) is a duel between two Shugenja, both trying to prove their superiority with the elements. 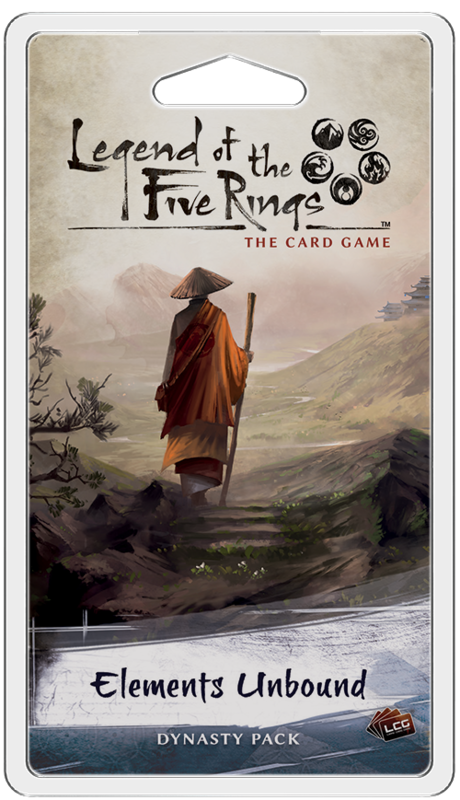 Now, you can challenge your opponent to a Taryū-Jiai duel in Legend of the Five Rings: The Card Game. During a conflict, you can play this event to select two Shugenja characters, one controlled by you, one by an opponent, and have them participate in a glory duel! The winner can resolve a ring effect as if they were the attacking player. 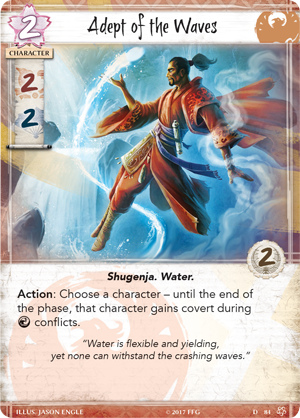 With the Phoenix's trademark high-glory Shugenja like Adept of the Waves (Core Set, 81), they immediately have the advantage in a glory duel. Should you succeed, resolving the ring effect can also trigger cards like Asako Azunami (The Ebb and Flow, 66), giving you an even greater reward for winning the duel. The Phoenix also receive a new way to manipulate the state of the rings in Elements Unbound with the Roving Michibiku (Elements Unbound, 118). 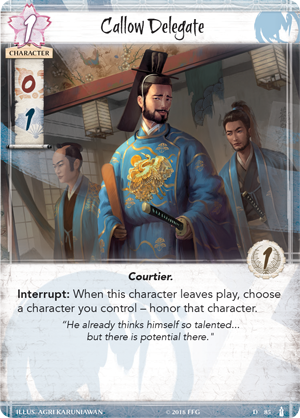 The Roving Michibiku is a balanced character who can contribute to military and political conflicts equally, but their true power comes with their ability to steal a ring your opponent has claimed when you win a conflict. While this does not give you the effects of the ring, the Phoenix have plenty of ways to take advantage of this effect. For example, with Isawa Tadaka (Disciples of the Void, 10) on the field, you can completely take away your opponent’s ability to play events already in their discard pile. Or, you can give your Henshin Disciple (Fate Has No Secrets, 87) an appropriate boost. Either way, the Roving Michibiku is extremely synergistic with the rest of the clan, and can set up some impressive combos. Rokugan sits on the edge of disaster. Air, Earth, Fire, Water and the Void are all falling out of balance, and the catastrophes that have already struck the Emerald Empire are just the beginning. When these five elements come together into a raging fury, what Clan will come out on top, and will Rokugan still be standing? 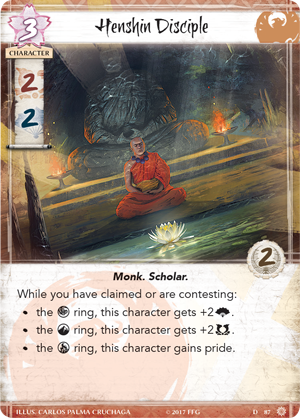 The Elemental Cycle comes to a thrilling conclusion with Elements Unbound (L5C14), available now for pre-order from your local retailer or our website!